As a working single mother, Lynn Woolsey spent several years receiving public assistance to help make ends meet while she raised three small children. “I know what it means to have a safety net when you need help getting back on your feet,” Woolsey recalled. “I can go to Washington and say, ‘I've been there.’”1 Describing herself as the “first former welfare mom to serve in Congress,” Representative Woolsey focused on issues facing children and families during her 20-year career in the U.S. House of Representatives. 1Jane Gross, “Running on Experience: On Welfare, Then Off It,” 16 June 1992, New York Times: A16. See also Carolyn Lochhead, “Ex-Welfare Mom Takes Congress to Task; Lawmaker Draws on Experience,” 10 March 1994, San Francisco Chronicle: A4. 2Lynn Robinson birth register, Washington State Birth Index, 1930–1939, Washington State Library, Olympia, WA: http://www.vitalsearch-ca.com (accessed 15 April 2013); Sixteenth Census of the United States, 1940: Seattle, King County, Washington, Roll T627_4375, page 6B, Washington State Library, Olympia, WA http://search.ancestrylibrary.com (accessed 17 April 2013);Washington, Marriage Records, 1865–2004, Washington State Library, Olympia, WA http://search.ancestrylibrary.com; California Divorce Index, 1966–1984, Library of Congress, Washington, D.C.: http://search.ancestrylibrary.com (accessed 14 August 2012); California Marriage Index, 1960–1985, Library of Congress, Washington, D.C.: http://search.ancestrylibrary.com (accessed 14 August 2012); Politics in America, 2000. (Washington, D.C.: Congressional Quarterly Inc., 1999): 99; Congressional Directory, 112th Congress (Washington, D.C.: Government Printing Office, 2012): 22. 3“Election Statistics, 1920 to Present,” http://history.house.gov/Institution/Election-Statistics/Election-Statistics/; California Secretary of State Debra Bowen, “Statement of Vote: Primary Election June 2, 1992”; “Politics Aside, California GOP Candidate Battles for His Life,” 13 October 1992, the Associated Press. 4Congressional Directory, various editions (Washington, D.C.: Government Printing Office, 1993–2013). 5Politics in America, 2010 (Washington: Congressional Quarterly Inc., 2009): 81; Congresswoman Lynn Woolsey, “House Includes Woolsey Proposal to Help Military Families in Bi-Partisan SCHIP Bill,” Congresswoman Lynn Woolsey, http://web.archive.org/web/20071101061915/http://woolsey.house.gov/latestnews.asp?ARTICLE5110=2151542&PG5110=1 (accessed 21 February 2013). 6Almanac of American Politics, 2002 (Washington, D.C.: National Journal, Inc., 2001):175; Politics in America, 2004 (Washington, D.C.: Congressional Quarterly Inc., 2003):79. 7Congresswoman Lynn Woolsey, “House Passes Woolsey Initiative to Encourage Women and Minorities to Study Computer Science,” Congresswoman Lynn Woolsey, http://web.archive.org/web/20090528022038/http://woolsey.house.gov/latestnews.asp?ARTICLE5110=2845148&PG5110=1 (accessed 21 February 2013). 8The bill status of H.R. 5875 is listed here: http://thomas.loc.gov/cgi-bin/bdquery/z?d109:h.r.05875; Politics in America, 2008 (Washington, D.C.: Congressional Quarterly Inc., 2007) 83; Politics in America, 2010: 81. Woolsey supported a revocation of the Patriot Act on the grounds of the abuse of civil liberties. 9Congressional Record, House, 109th Cong., 2nd sess. (25 January 2005): H172; Lynn C. Woolsey, “It's Time for Smart Security,” 1 December 2009, Politico: http://www.politico.com/news/stories/1109/30008.html (accessed 25 February 2013); Woolsey introduced H. Res. 227 during the 110th Congress. See http://thomas.loc.gov/cgi-bin/thomas for more information. 10For two examples of Woolsey’s opposition to the Obama administration’s approach to the war effort, see Congressional Record, House, 112th Cong., 1st sess. (6 January 2011): H74; and Congressional Record, House, 112th Cong., 1st sess. (26 January 2011): H501. 11Congresswoman Lynn Woolsey,“Woolsey’s Military Family Bill Signed Into Law,” Congresswoman Lynn Woolsey, http://web.archive.org/web/20080227221957/http://woolsey.house.gov/latestnews.asp?ARTICLE5110=2154177&PG5110=1 (accessed 21 February 2013). 12Almanac of American Politics, 2008 (Washington, D.C.: National Journal, Inc., 2007): 179; Almanac of American Politics, 2012 (Washington, D.C.,: National Journal, Inc., 2011): 147; Politics in America, 2008 (Washington, D.C.,: Congressional Quarterly Inc., 2007): 83; Congresswoman Lynn Woolsey, “Woolsey Touts ‘People’s Budget,” Says Bringing Home Troops is ‘Moral Imperative’ and ’Fiscal Common Sense,” 4/13/2011 press release. 13Pamela J. Podger, “Woolsey Smokes Challenger in Primary,” 6 March 2002, San Francisco Chronicle: A24. 14Melanie Starkey, “Woolsey to Retire After Two Decades in House,” 27 June 2011, Roll Call. 15Congressional Record, House, 112th Cong., 2nd sess. (12 December 2012): H6709. Papers: 1993-2013, 170 linear feet. The papers of Congresswoman Lynn Woolsey include legislative research, introduced and passed bills, speeches, manuscripts, awards, and visual media documenting the years of service to Sonoma and Marin counties. 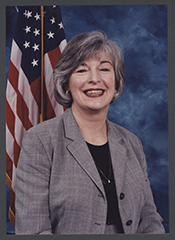 "Lynn C. Woolsey" in Women in Congress, 1917-2006. Prepared under the direction of the Committee on House Administration by the Office of History & Preservation, U. S. House of Representatives. Washington: Government Printing Office, 2006. The Honorable Lynn C. Woolsey reflects on how she prioritized which committees she sought to serve on throughout her time in Congress. The Honorable Lynn C. Woolsey describes talking openly to her colleagues about her experiences as a single mother on welfare.